Old World Form. Modern Function. Rare is the opportunity to own a genuinely functional work of art. Introducing the LaCie Sphère, design by Christofle. 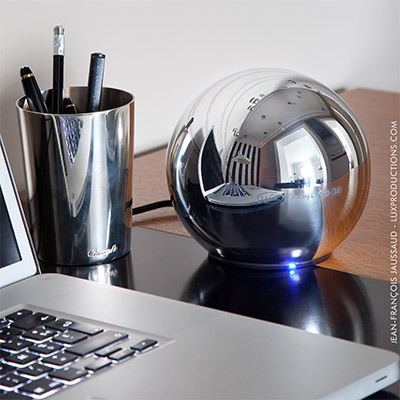 Handcrafted and silvered in France, with embedded technology by LaCie, the Sphère adds prestige to any business or home office. Since its founding in France in the 1830s, Christofle has symbolized luxury and elegance. 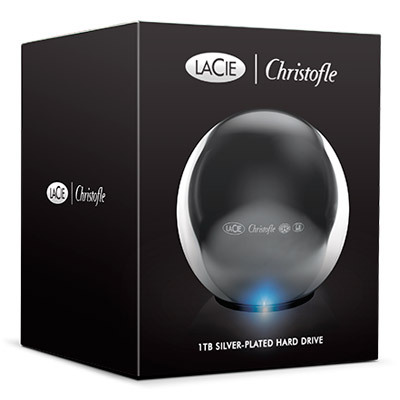 The LaCie Sphère demonstrates Christofle’s commitment to innovative design for every era. Its unique round shape requires silversmiths in Christofle’s Normandy workshop to conduct a precise manual silver plating procedure. They stamp it with Christofle’s hallmark signature and then polish for perfect brightness. This time-consuming process results in a bold silhouette and highly reflective surface. Gracing any desk or table, the LaCie Sphère never fails to turn heads and spark conversation. The LaCie Sphère is as practical as it is beautiful. It features high-speed USB 3.0, which makes file transfers and backups nearly three times faster than with USB 2.0. Its 1 TB of storage also gives you enough space for years of backups or an extensive photo, video, and music library. The LaCie Sphère is even powered through the USB cable, so no power cord is ever necessary.